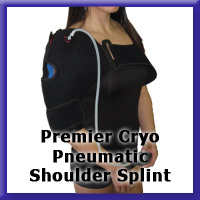 The Premier Cryo Pneumatic Shoulder Splint was designed to offer both pneumatic compression and cold therapy. 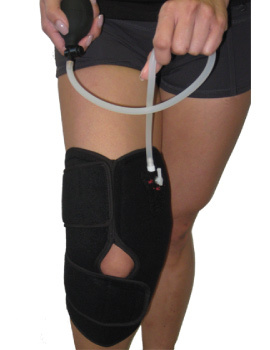 This device is ideal for post-surgical application or as a rehabilitation therapy program to help reduce edema and decrease pain. It features both a detachable pump and contoured reusable gel pack. The splint was developed with patient comfort in mind it has a foam wrap with contact closure straps, removable gel pack with tricot lining and a non-toxic gel. 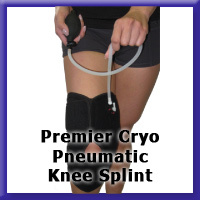 The Premier Cryo Pneumatic Knee Splint was designed to offer both pneumatic compression and cold therapy. 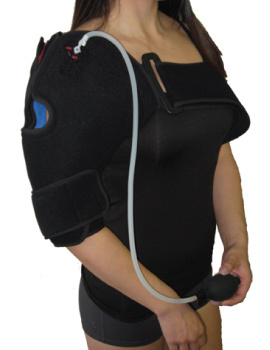 This device is ideal for post-surgical application or as a rehabilitation therapy program to help reduce edema and decrease pain. It features both a detachable pump and contoured reusable gel pack. The splint was developed with patient comfort in mind it has a foam wrap with contact closure straps, removable gel pack with tricot lining and a non-toxic gel.